This article is about the person in the Ahemmusa Camp. For other uses, see Mamaea (disambiguation). 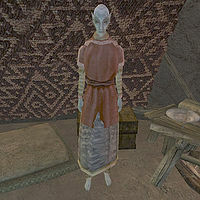 Mamaea is a Dunmer healer who belongs to the Ahemmusa Ashlander tribe. She has her own yurt at their camp in the Grazelands, where she offers a selection of potions for sale to visiting travelers. She is not in any way connected to the Sixth House stronghold of Mamaea or Foyada Mamaea, despite sharing a name. This page was last modified on 22 June 2018, at 08:20.